Sometimes, to me, the best souvenirs from Walt Disney World are those that you happen upon or that are free. When at Walt Disney World, no self-respecting geek should be caught without their Monorail System Co-Pilot License. In the event that you have no co-piloted your own monorail, today’s Disney-It-Yourself will assist you in making one of your very own. For today’s project you will needs to print out the image above (through trial and error, I suggest printing the image as a 3.5x5 picture), scissors, and a glue stick. Using the scissors, cut out the co-pilot license. Fold the license in half, horizontally. Open the license up and apply adhesive using a glue stick (regular glue will pucker the paper) to one side of the back. Refold the paper and allow the glue time to dry. 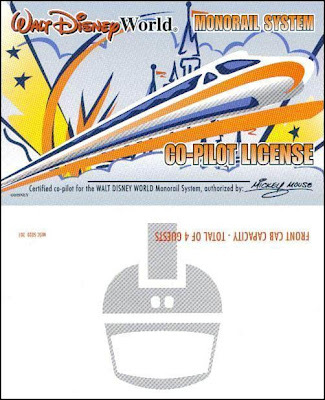 Sign your Walt Disney World Monorail System Co-Pilot License.